Optical fiber (referred to as fiber) has a lot of types. According to the materials used in the manufacture of optical fiber classification as Quartz Fibers, Multi-component Glass Fibers, and Plastic Optical Fibers. According to the light in the fiber transmission mode can be divided into: Single-mode fiber and Multi-mode fiber. The optical fiber is classified on the one hand according to the refractive index distribution of the core profile, and on the other hand, according to the number of patterns transmitted. As described above, it is divided into single-mode optical fiber and multimode optical fiber. According to the profile refractive index distribution is divided into step optical fiber, gradient refractive index optical fiber and special profile refractive index distribution optical fiber. Step Refractive index The refractive index of the optical fiber over the entire cross section is constant. 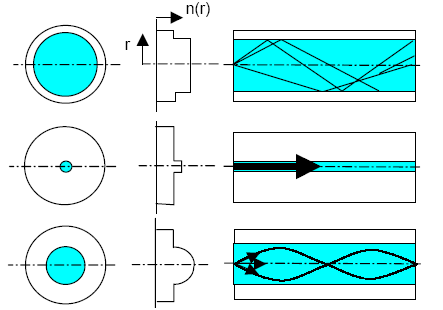 Gradient Refractive Index The optical fiber cross section is non-linear, rotationally symmetric, and the refractive index decreases from the center to the edge. Step Refractive index The refractive index of the multimode optical fiber is constant, so its distribution index g = α. Gradient Refractive Index The refractive index of the optical fiber decreases from the center to the edge. The light travels along the axis of the optical fiber, rather than straight. Nanjing Hecho Technology Co., Ltd. supply glass fiber, plastic optical fiber and quartz fiber products, including Fiber Optic Bundles, Fiber Optic Sensors, Fiber Optic Cold Light Source, please call us freely!